Binocular eye movements are either conjugate (versions) or disconjugate (vergences). Versions are movements of both eyes in the same direction (eg, right gaze in which both eyes move to the right). Dextroversion is movement of both eyes to the right, and levoversion is movement of both eyes to the left. Sursumversion (supraversion) and deorsumversion (infraversion) are elevation and depression of both eyes, respectively. Yoke muscles are the primary muscles in each eye that accomplish a given version (eg, for right gaze, the right lateral rectus and left medial rectus muscles). Each extraocular muscle has a yoke muscle in the opposite eye to accomplish versions into each gaze position. By the Herring law, yoke muscles receive equal and simultaneous innervation. The magnitude of innervation is determined by the fixating eye, which means that the angle of deviation between eyes (strabismus) may vary depending on which eye is fixating. The primary deviation is misalignment, with the normal eye fixating. If the paretic eye fixates, the ensuing secondary deviation is typically larger than the primary deviation. As opposed to versions (in which both eyes move in the same direction), vergences are movements of the eyes in opposite directions. Convergence is movement of both eyes nasally, and divergence is movement of both eyes temporally. Vertical vergence movements may also occur (ie, one eye moving upward or the other eye moving downward relative to the contralateral eye). Accommodative convergence is convergence of the eyes stimulated by accommodating or focusing on a near target. Abnormality of the accommodative convergence to accommodation ratio may cause certain types of strabismus. [4, 5, 6] Fusional convergence and divergence are optomotor reflexes that are designed to position the eyes such that the image of regard falls on the fovea of each eye. This motor fusion is important to avoid diplopia (double vision). The field of action of an extraocular muscle is the direction of rotation of the eye when that muscle contracts. This term also indicates the gaze position in which the effects of a muscle most easily are demonstrated. Knowledge of fields of action is important; strabismus often increases in the field of action of a weak eye muscle. For patient education information, see the Eye and Vision Center, as well as Anatomy of the Eye. 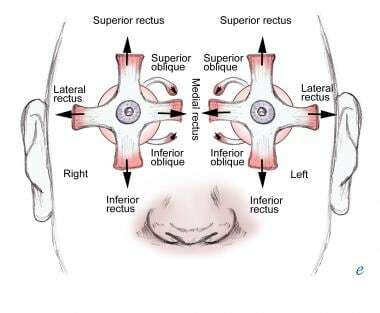 Superior and inferior rectus muscles are the primary vertical movers of the eye. The superior rectus acts as the primary elevator, and the inferior rectus acts as the primary depressor of the eye. This vertical action is greatest with the eye in the abducted position. The direction of pull of the muscles forms a 23° angle relative to the visual axis in the primary position, giving rise to secondary and tertiary functions. The secondary action of vertical rectus muscles is torsion. The superior rectus is an incyclotorter, and the inferior rectus is an excyclotorter. The tertiary action of both muscles is adduction. Superior and inferior oblique muscles are the primary muscles of torsion. The superior oblique creates incyclotorsion, and the inferior oblique creates excyclotorsion. As the direction of pull for both muscles forms a 51° angle (relative to the visual axis in the primary position), secondary and tertiary actions occur. The secondary action of the oblique muscles is vertical, and it is best demonstrated when the eye is adducted with the superior oblique acting as a depressor and the inferior oblique acting as an elevator of the eye. The tertiary action of each muscle is abduction. The major conjugate eye movement systems are the saccadic and pursuit systems. 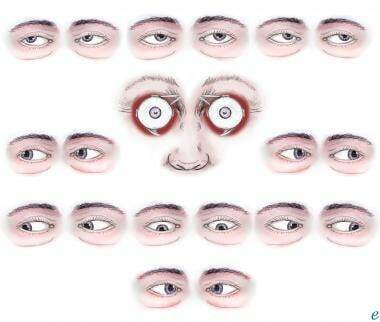 The saccadic system controls rapid eye movement and maintains fixation (foveation) on the object of regard. Horizontal saccades are controlled by contralateral frontal eye fields in the frontal lobe. The right frontal lobe controls horizontal saccades to the left, and the left frontal lobe controls horizontal saccades to the right. The pursuit system controls smooth tracking to follow slow-moving objects. The pursuit movements are controlled by the ipsilateral parietal lobe (ie, right pursuit is driven by the right parietal lobe, and left pursuit is driven by the left parietal lobe). Most voluntary eye movements are a combination of saccade and pursuit eye movements. Control of the vergence system is presumed to be located at the level of the brainstem. Retinal disparity is thought to be the stimulus that drives the divergence or convergence (motor fusion) that occurs in the maintenance of sensory fusion and stereopsis. Catalano RA, Nelson LB. Anatomy of the eye. Pediatric Ophthalmology. A Text Atlas. Norwalk, Conn: Appleton & Lange; 1994. 2-4. Wright K, ed. Anatomy and physiology of the extraocular muscles. Pediatric Ophthalmology and Strabismus. St. Louis, Mo: Mosby-Yearbook Inc; 1995. 89-101. Von Noorden GN. Physiology of the ocular movements. Binocular Vision and Ocular Motility. 5th ed. St. Louis, Mo: Mosby-Yearbook Inc; 1996. 53-80. Helveston EM. Surgical management of strabismus. Surgical Anatomy. 4th ed. St. Louis, Mo: Mosby-Yearbook Inc; 1993. 23-84. Parks MM. Ocular Motility and Strabismus. Hagerstown, Md: Harper & Row; 1975. Yu Wai Man CY, Chinnery PF, Griffiths PG. Extraocular muscles have fundamentally distinct properties that make them selectively vulnerable to certain disorders. Neuromuscul Disord. 2005 Jan. 15(1):17-23. [Medline]. Jordan DR. Localization of extraocular muscles during secondary orbital implantation surgery: the tunnel technique: experience in 100 patients. Ophthalmology. 2004 May. 111(5):1048-54. [Medline]. The authors and editors gratefully acknowledge the contributions of the previous coauthor, D Brian Stidham, MD, to the development and writing of this article.